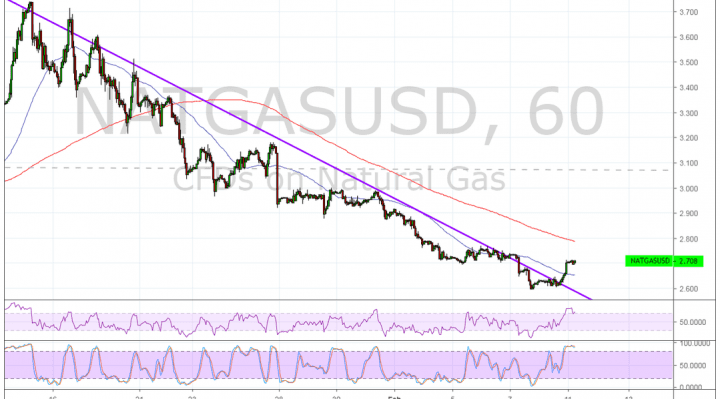 Natural gas had been forming lower highs to trade below a descending trend line on its 1-hour chart. Price has recently busted through this resistance to signal that a reversal is in the works. However, the 100 SMA is still below the longer-term 200 SMA to indicate that the path of least resistance is to the downside. In other words, the downtrend is more likely to gain traction than to reverse. Still, price has also moved past the 100 SMA dynamic inflection point as an early indication of bullish momentum. RSI is already in the overbought zone and is starting to turn lower to signal a return in selling pressure. This could spur a pullback to the broken trend line resistance or 100 SMA dynamic support. Stochastic is also indicating overbought conditions or that buyers are tired. The oscillator has yet to turn lower to signal a return in selling pressure. Qatar is urging India to include natural gas in its Goods and Services Tax (GST), something that the local industry is also lobbying for. This would provide them with an input tax credit and help rationalize taxes and also mean more income for Qatar, which is India’s biggest supplier of the commodity at 8.5 million tonnes a year. Looking ahead, supply and demand dynamics could determine whether or not the commodity is able to hold on to its gains and go for more. There are still plenty of geopolitical risks in play, with high-level US-China trade talks likely to impact overall market sentiment.